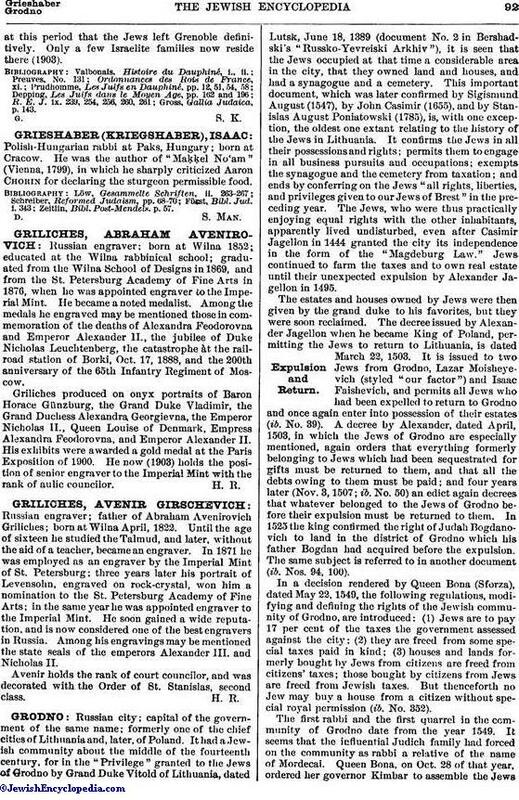 Russian engraver; father of Abraham Avenirovich Griliches; born at Wilna April, 1822. Until the age of sixteen he studied the Talmud, and later, without the aid of a teacher, became an engraver. In 1871 he was employed as an engraver by the Imperial Mint of St. Petersburg; three years later his portrait of Levensohn, engraved on rock-crystal, won him a nomination to the St. Petersburg Academy of Fine Arts; in the same year he was appointed engraver to the Imperial Mint. He soon gained a wide reputation, and is now considered one of the best engravers in Russia. Among his engravings may be mentioned the state seals of the emperors Alexander III. and Nicholas II. Avenir holds the rank of court councilor, and was decorated with the Order of St. Stanislas, second class.